Checking up on TCM this evening, it came to my attention that Backlots’ Star of the Week Myrna Loy is in the news. Biographer Emily W. Leider has written the very first book about Loy’s life, entitled Myrna Loy: The Only Good Girl in Hollywood, and slated to hit the bookshelves later this month. It has already been touted by Leonard Maltin as a “highly readable, informed biography,” and promises to reveal backstories on Loy’s many friendships in Hollywood and her extraordinarily long career. It very much surprises me that no book like this (aside from Loy’s own autobiography, Being and Becoming, published in 1987) has been written about Myrna Loy up to now. She is and was so well-loved in the classic film world, and though a private person herself, was friends with just about everyone in Hollywood and it would have been very easy to research and write 30 years ago. In fact, I believe that Emily W. Leider has done a very difficult task in WAITING to write this book, as the vast majority of those who knew and worked with Myrna Loy are now gone. At any rate, this promises to be an immensely interesting read, and I love that this came to my attention just as Myrna Loy became Star of the Week. Here is the link to pre-order your copy at Barnes and Noble. I will post a review of this book once it comes out! Her “Being and Becoming” is one of the best film star autobiographies I’ve read. Very curious about and interested in this new bio. Will definitely be checking this one out! Thanks for the heads up, Lara! Finally! A biography of a star whom everybody adores. 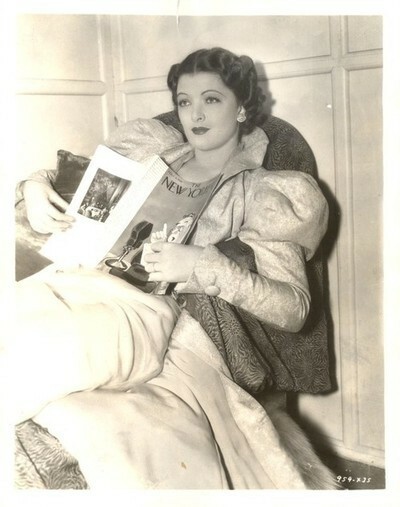 Who doesn’t love Myrna Loy?!?!? Thanks for alerting me to this one! My all-time, most favorite actress ever! So excited about this book!